Mercury’s high density has been a longstanding puzzle in planetary science. Its density means that it must have a significantly higher iron abundance than Venus, Earth, Mars, or the asteroids, probably in the form of a large iron core. A common popular explanation (the one I was taught four years ago in my Intro Planetary Science course) is that a giant impact came along late in the formation process and stripped the silicate mantle off of Mercury, leaving behind an iron-rich planet. However, in the last four years NASA’s MESSENGER mission has challenged that idea: measurements of elements like potassium—which would be extremely depleted after such a giant impact—show no depletion, so the giant impact hypothesis has been largely ruled out. A new hypothesis is required. In the past four years, we’ve also found some irradiated rocky exoplanets, most of which are even hotter than Mercury, and there is some evidence to suggest that the two hottest rocky exoplanets with measured masses (Corot-7b and Kepler-10b) may also be more iron-rich than the Earth. While still in the realm of small-number statistics, this is suggestive that there is some more universal process shaping the formation and evolution of rocky planets. In this paper, the authors propose an explanation for the formation of both Mercury and these iron-rich exoplanets. This cartoon illustrates how the general sorting mechanism proposed in this model works. The top panel shows that at the illuminated edge of the disk, silicates are pushed more efficiently than metals by this process. The bottom panel illustrates the resulting composition difference in the protoplanetary disk. 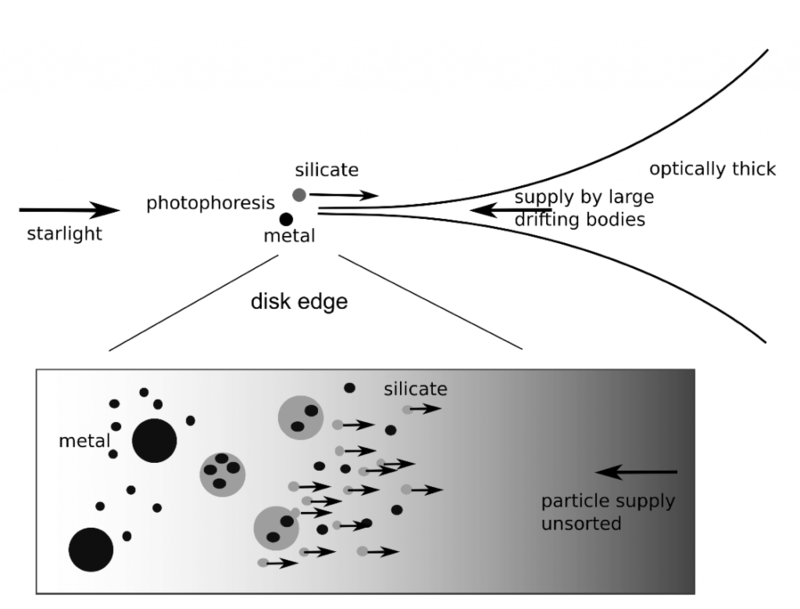 The basic idea proposed here is that there is a mechanism in the disk that sorts metals from silicates, making the inner part of the disk more metal-rich and the outer part of the disk more metal-poor (and thus silicate-(rock-)rich). (I’ll note that here I’m using “metal” not in the astronomer’s sense—anything heavier than H/He—but in the normal Earthling usage where metals are metallic.) If this sorting mechanism were efficient on timescales shorter than the formation of planets (a few million years), then the planets that formed from the inner material would naturally be more iron-rich. Figure 3 shows a cartoon version of how this process occurs. The disk starts out with uniformly distributed iron and silicates, and then the silicates get preferentially pushed to the outer regions of the disk. This cartoon illustrates how the proposed mechanism photophoresis works. In the presence of irradiation, a particle will have a warm side and a cool side. When gas molecules hit the particle, those rebounding from the warm side will have higher energy (and therefore higher velocities) than those rebounding from the cool side. This imparts a net force, away from the irradiating source, on the particle. The mechanism that they propose to do this sorting is called photophoresis. The idea is that a particle in a protoplanetary disk will be illuminated on one side (by the Sun), and that side will become warmer. The particle will then be hit by the molecules in the disk. 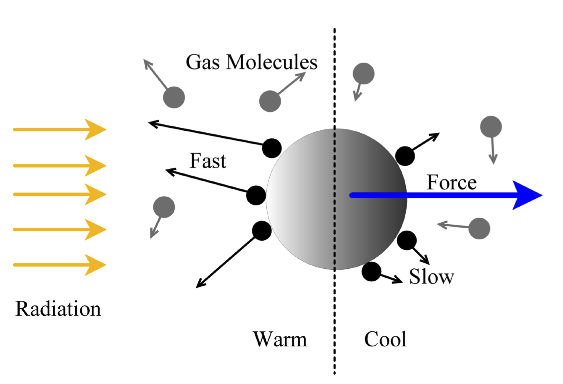 These molecules will equilibrate to the surface temperature of the particles before being ejected with the energy (and velocity) corresponding to that temperature. Since the temperature is asymmetric—hotter on the illuminated side—the net momentum imparted onto the particle will also be asymmetric. In general, the particle will be pushed outward, away from the illuminating source. It’s clear how this mechanism could move particles—but why does it sort them by composition? The reason is that the strength of the photophoretic force is inversely proportional to the thermal conductivity. This is straightforward to understand conceptually: if a particle has high thermal conductivity, the heat travels efficiently through the particle, so even though only one side is illuminated, the whole particle will warm up. The temperature difference between the warm and cold side will be small, and a smaller net momentum will be imparted by the molecules hitting and rebounding from the particle. If instead the material has a low thermal conductivity (an insulator), heat travels slowly through the particle, so the temperature difference between the sides of the particle will be larger, and the corresponding net momentum gained will be larger. Since iron is a metal, it has a high thermal conductivity, about 50 W/(mK). Silicates have much lower thermal conductivity, about 1 W/(mK). This means that photophoresis will be about 50 times more efficient at transporting silicates away from the Sun than iron particles. Based on the properties of a protoplanetary disk, the authors calculate the drift times for particles to move 1 AU to be 300,000 years for silicate grains (well within the formation timescale of planets) and 50 times longer, or 15 million years, for iron grains (similar to the timescale to form planets). Photophoresis would thus naturally create a composition gradient in the disk, with metal-enrichment in the inner parts and silicate-enrichment in the outer parts. This could explain the iron-enrichment of Mercury, as well as the apparent slight iron-enrichment of the rocky exoplanets Corot-7b and Kepler-10b. Of course, many other physical mechanisms are at play during planet formation, but the authors suggest that exploring this mechanism further could be fruitful in explaining both solar and extrasolar planetary systems. Mercury’s surprising density: What about magnets? Did Mercury Spin Backward? Testing the Limits of Gravity at Mercury Why is there nothing between Mercury and the Sun? Wouldn’t these particles, which are undergoing lot of collisions, be spinning? What would that do to the temperature asymmetry? (I admit I haven’t read the article completely, but I did download it and search for “spin” and “rotat” and didn’t see that this was addressed. Nice post! But we shouldn’t just sweep the giant impact hypothesis for the formation of Mercury into the dustbin of history. It’s true that MESSENGER found much more potassium (and thus volatiles) on Mercury than anyone expected. The paper announcing these results (Peplowski et al. 2011, Science) made some strong claims: “the measured K abundance is inconsistent with the giant impact hypothesis,” etc. Earth’s Moon is relatively depleted in potassium (Earth is not) and we think that’s related to the giant impact that formed Moon. However, not all giant impact scenarios predict dramatic volatile depletion. Sarah Stewart and colleagues wrote a great abstract about this problem for the 2013 Lunar and Planetary Science Conference (http://www.fas.harvard.edu/~planets/sstewart/reprints/abstracts/2013_LPSC_Stewart_2306.pdf). To quickly summarize, giant impacts do vaporize a lot of volatiles. Moon is depleted in potassium because a good chunk of the proto-lunar disk (containing most of the potassium) accreted to Earth. In contrast, Mercury’s vaporized volatiles may have remained gravitationally bound to Mercury and eventually re-condensed.